We’re excited to announce that the USGBC blog has moved to the new USGBC.org website. And don’t forget to update our RSS feed link in your readers. Mark MacCracken, Immediate Past Chair of USGBC’s Board of Directors and CEO of CALMAC Manufacturing Corporation, is embarking on an adventure that’s taken him and his 25-year-old son, Josh, to the Swiss Alps; where they are climbing the Matterhorn, one of the highest peaks in the region, and clearly the most recognizable. Each foot they climb is raising money to build USGBC’s LEED Platinum Project Haiti Orphanage & Children’s Center being designed by HOK Architects. Mark MacCracken: I was fortunate to first visit Switzerland and Zermatt almost 20 years ago and have been going with my wife Kimberly to ski for many years. The mountain is truly majestic and the lure to climb it was palpable, at least for me. About 10 years ago I mentioned it to my son and we put it in the “bucket” list. Two years ago my son said to me, “Dad, you aren’t getting any younger, I think we need to do this now.” I’m always looking for adventures for my son and I to take together and this seemed like a perfect fit. Knowing my year as Chair of USGBC’s Board of Directors would be very demanding on my time, and needing time to prepare, we set the date for Summer 2012. ML: What did you have to do to get ready for this trip? MM: Since it is a pretty dangerous adventure, my wife, Kimberly, laid down the ground rules: I had to take a mountaineering course first and had to get in great condition. Last year I took an extensive mountaineering course, learned all the safety techniques including cravats rescue and climbing in snow with crampons on 60 degree inclines. 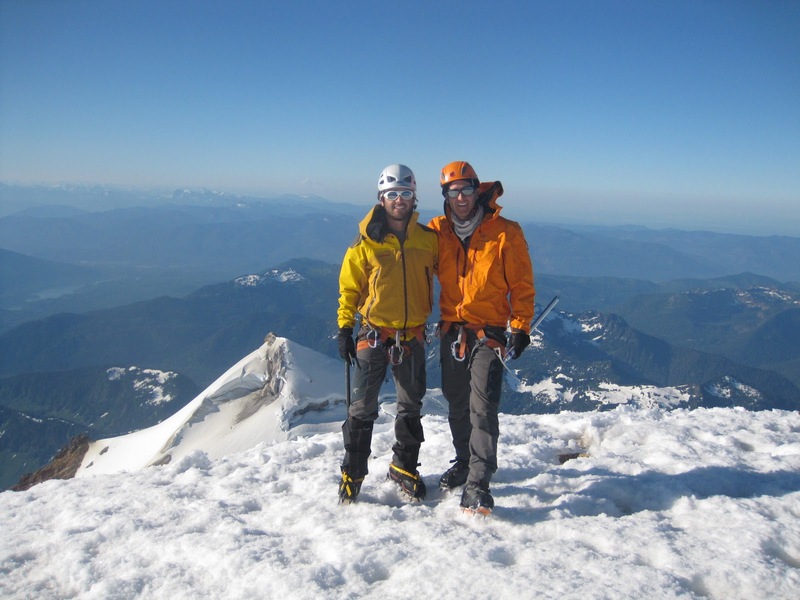 The week ended with an ascent of Mount Baker in Washington, which is about 11,000 feet. Physically, the Matterhorn climb is very demanding. I spent about two years getting into better shape. One of the best preparation exercises has been climbing the stairs in the 36-story building where I live (New York City). I slowly built up from doing the building two or three times, with no pack, to nine times in succession with 30 pounds on my back. I would take the elevator down, to save the knees and time, which resulted in some interesting conversations and some new friends. ML: How are you using this opportunity to raise money for Project Haiti? MM: I’ve wanted to do some type of fundraising for Project Haiti and was looking for a good opportunity that would be challenging and worthwhile. I had the idea to link it to the climb and after supportive conversations with Rick (Fedrizzi, USGBC’s president & CEO) and Roger (Limoges, USGBC’s vice president of organizational development) it became real. At USGBC’s Mid-Year Meeting this summer, I was given the opportunity to speak to all of the attendees during the opening plenary, and I announced my intentions in front of more than 500 USGBC chapter leaders and board members. Within just the first 20 minutes more than 30 people emailed me saying they wanted to make a donation. I wanted it to be simple for people to donate, so for every foot I climb on the Matterhorn, I asked for a penny to be pledged toward Project Haiti. On the big day, we climb Hornli Hut at 10,000 feet to the peak at 14,800 feet, so each cent would be a $48 dollar donation, rounded to $50 if I made the summit. To incentivize further, my company, CALMAC, agreed to matching the funds I raised through others, up to $10,000. To my surprise some people donated 5, 10 and even 20 cents per foot! Nearly 100 percent of USGBC¹s Board of Directors, and dozens of USGBC Chapter leaders, industry contacts, squash buddies and friends are supporting this cause. ML: What are you most excited about for this adventure? MM: Sharing this experience with my son is what I am looking forward to the most. The Swiss Alps are mystical with rolling fields and fantastic snow covered mountains so we will just take it all in. I’m also excited that through this experience, I will be able to contribute to Project Haiti in a meaningful way. I will be thinking about the children and families who will benefit throughout this journey.